Tungsten Outlook 2019: Will Shortfalls Drive Prices Up? What is the tungsten outlook for the year ahead? Market participants discuss what happened in 2018 and what could be next in 2019. 2018 started with experts predicting that tungsten prices could trend higher if China — the world’s leading producer of the critical metal — reduced output. That call was in some ways correct. Though prices hit three-year highs due to production limitations and growing demand for the versatile metal, they had flattened by the end of the year. As 2018 comes to an end, the Investing News Network (INN) is looking back at the main trends in the space this year and what’s ahead for prices in 2019. Read on to learn more about the tungsten outlook. As mentioned, analysts believed at the beginning of the year that tungsten prices would continue on the positive trajectory they started in 2016. However, the metal ended the year slightly flat — much to the dismay of market watchers and producers. “At the end of 2017, our expectations were for the strengthening of tungsten prices to continue with some modest levels of additional production from new or recently commissioned tungsten-mining operations,” said Mick Billing, chairman and CEO of Thor Mining (ASX:THR). “We also expected that Chinese production costs would continue to rise, but that production levels from China would remain relatively constant,” he added. Midway through the year, China announced that there would be restricted supply of ammonium paratungstate (APT) as key APT smelters in Jiangxi province were shuttered in order to comply with government regulations around tailings storage and slag treatment. Despite demand expectations, tungsten prices took a brief stumble in mid-2018, coming to rest at US$340 to US$345 per metric tonne. “The slump of 20 percent in the APT price in July and August has probably challenged all in the industry. Since then, the market has seemed to lack direction and has been looking for a catalyst to move either way,” explained Billing. Looking ahead, demand for the critical metal, vital in making steel stronger and more durable, is expected to increase as stringent building regulations in China regarding the strength of industrial steel are implemented. However, while Chinese consumption of the metal is stepping up, so too are environmental regulations around extracting tungsten, creating an air of uncertainty when it comes to output. “We understand that more environmental inspections are scheduled in China, and that resulting from these more closures are expected. Unfortunately, we have no way of confidently predicting any outcome from this [situation],” added Billing. In 2017, global tungsten production hit 95,000 tonnes, up from 2016’s total of 88,100 tonnes. International output in 2018 is expected to top last year’s total, but if mines and projects are shut down and delayed, total output could be lower, creating scarcity and weighing on investor sentiment. Global production expectations for tungsten were also reduced in late 2018, when Australian miner Wolf Minerals halted production at its Drakelands mine in England due to a bitter and prolonged winter coupled with ongoing funding issues. According to Wolf, the site is home to the western world’s largest tungsten and tin deposit. For Thor Mining, 2018 brought some positive share price movement following the release of a definitive feasibility study (DFS). As 2018 draws to a close, the tungsten market is still slightly depressed, with APT prices sitting at US$275 to US$295 on December 3. However, a surge in demand in the new year could offset this trend and help prices recover. Billing believes tungsten could repeat the price trend it took in the early half of 2018. China will continue to be the top tungsten producer in 2019, as well as the country with the most tungsten consumption, with other countries slowly increasing their tungsten demand. When looking for a potential tungsten stock to invest in he said that savvy investors should look for companies that are near production, with low production costs. 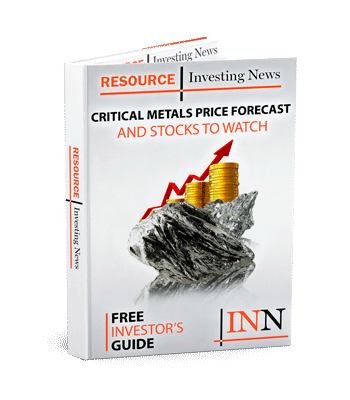 For investors interested in learning more about this critical metal, INN has put together a brief overview on how to get started on tungsten investing. Click here to read more. what does the price of tungsten have to be so mining would be profitable?